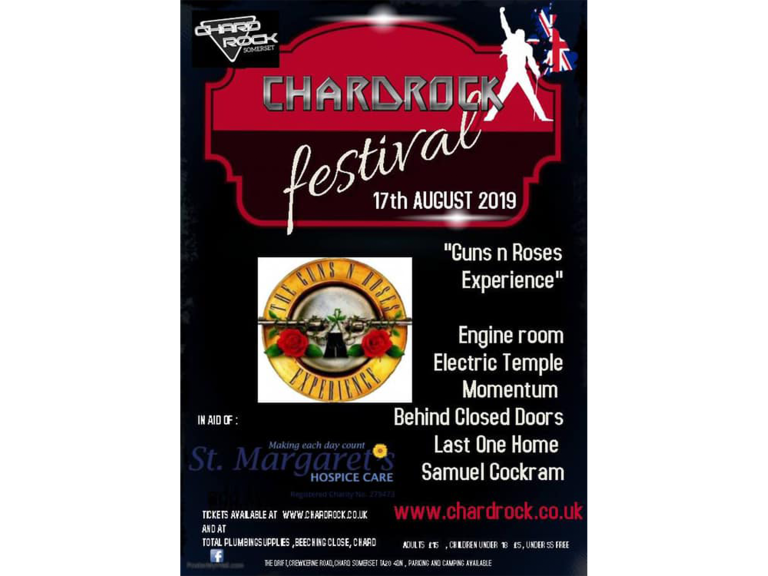 17th August 2019 - Chard Rock festival supporting St Margaret’s Hospice. The Guns & Roses Experience Headlining. "Chard Rock has been a dream of mine for years and thankfully I’m now in a position to dedicate some time to making it become reality. I’ve always been in a band from my early days at school and have performed with some great acts along the way. In the same way that I’ve had some great experiences in the industry I wanted to give other local bands the opportunity to perform and be alongside national bands like Livewire. As well as supporting the local bands it is a great chance to make music accessible to the South West. A lot of music festivals happen in big cities so this is the chance for the local community to benefit from good music."